From the air they look like defined green islands. From the water you are forced to look at your chart again to see if you could possibly have misread it, because that thing ahead of you more closely resembles a flooded, overgrown lawn than an island. 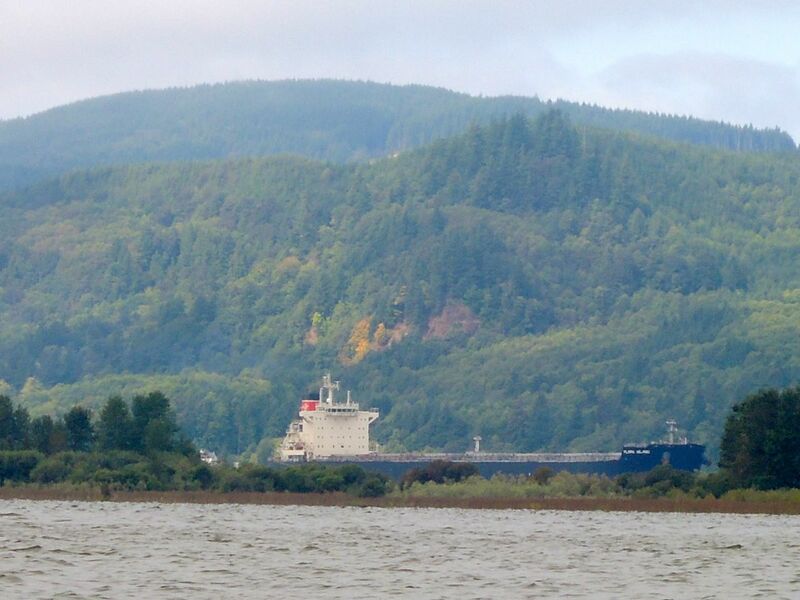 This is the Lower Columbia River Estuary. Scattered over the waters are dozens of low-lying islands, mazes of sloughs, and the romantic, yet sad, remains of fishing towns from the 1900’s. 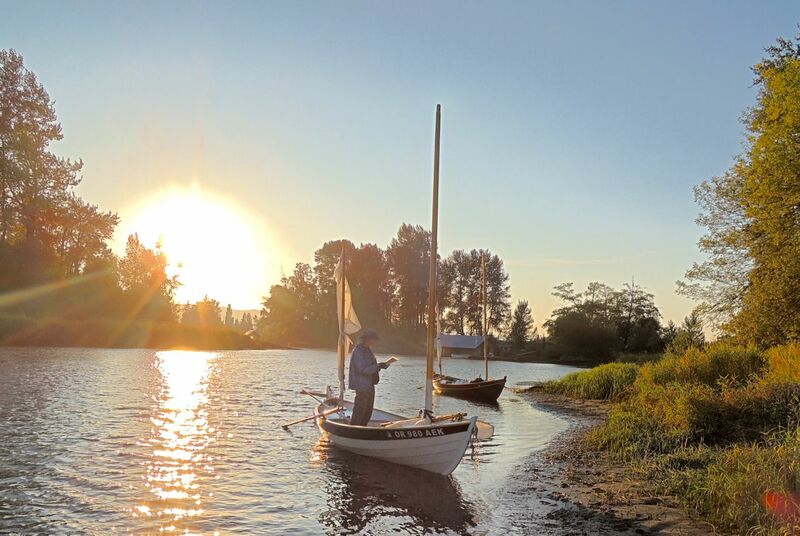 Searching a slough for a safe anchorage. There are all sorts of interesting currents, tides, and low-lying land forms down there. As the river slows down in this broad, flat area, sediment drops out of the water causing unique and changing bottom conditions. The main ship channel is dredged, but everywhere else, you’re on your own. A ship travels the dredged channel. Islands, thankfully, separate us. Kim and I were warned that there were sand bars; many of them hundreds or thousands of feet from shore. I was particularly good at finding them and running aground. Once getting my centerboard pinned to the ground and another time, catching my rudder and causing the downhaul to part. It’s unseamanlike to admit, but I thought it was funny. 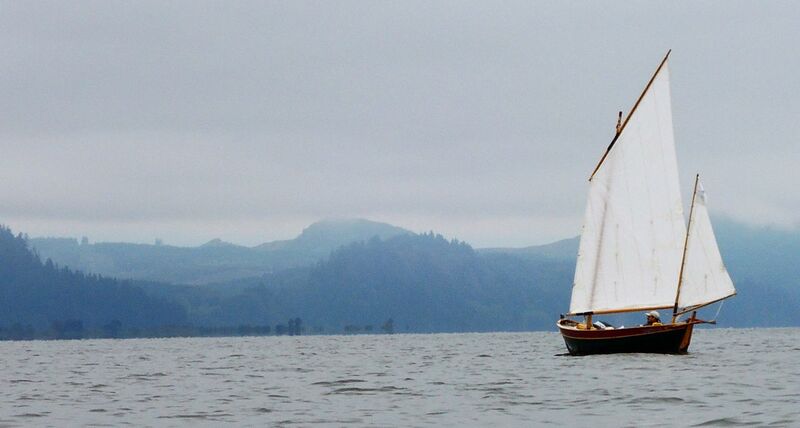 Each time I ran aground, instead of fearing for a capsize, worrying about being taunted, or getting wet, I laughed. I laughed that no one could predict the location of these strange “sands” as they were sometimes vaguely marked on the charts. I laughed that I was on a true adventure. No sculpted shores, no easy marinas, no one to bail us out. Forget about Google maps, leave your GPS at home, and certainly don’t rely on paper charts: just sail and use your eyes. Muddy and maze-like yes. Dull; not for a minute. A few folks have said they can’t comment on here. Can you? The comments aren’t on the map either? Perhaps your vignettes stand alone. It’s lonely standing alone, even if I’m way off the map! Keep the stories coming. 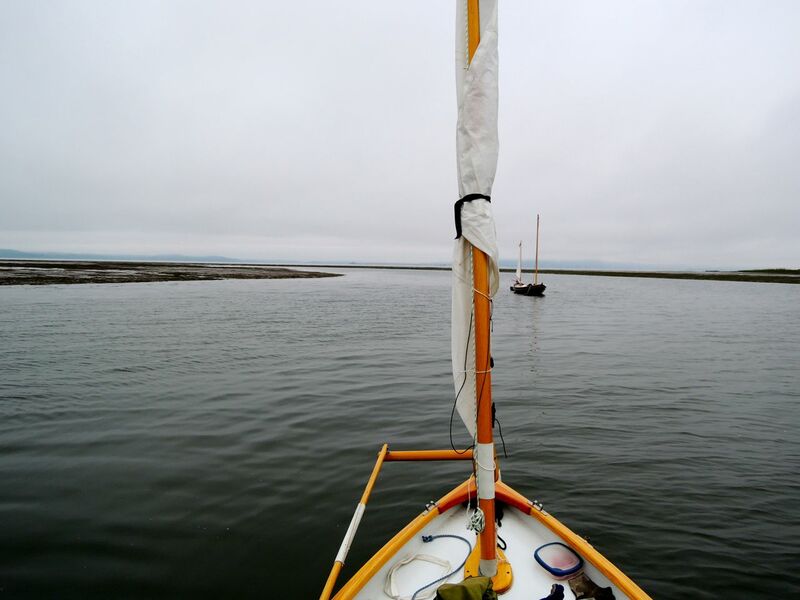 They capture the challenges of the main channel, the secret adventures of the backwater sloughs, and the opportunity to get a paddle, boot, or even a boat stuck in the mud. Thanks for sharing. Very eloquently put. I stay in dredged channel with our trawler. You are lucky to get “behind” the islands. Dagger boards are awesome. Hey Who is Kim? Is Kim a korean dude, a cat, or a girl with long red hair and a fish tail? Your fans want to know! Kim is all of those things. Kim is a state of mind. I rather like the idea of the red-haired mermaid (possibly something a fish biologist might study). I suspect the real ladies of mystery here are the boats. Check out that silhouette against the backdrop of the Columbia. Quite a beauty. Sigmund and Row Bird thank you for the acknowledgement.